Today's mission is to declutter your closet of excess hanging clothes. Of course, as always, this does not mean to get rid of all of the clothes you've got on hangers, but instead just the ones which have become clutter. 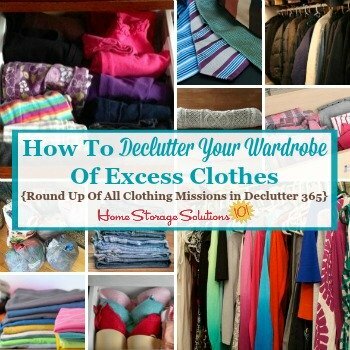 This mission is designed to be done while working through the Organize Master Bedroom Closet Challenge here on the site, which is part of the 52 Week Organized Home Challenge. As always, I try to break down these daily decluttering missions into more manageable chunks, to make the process of getting rid of your clutter easier and less overwhelming. If you get overwhelmed easily, and still have a lot of hanging clothes, make sure to do just one rod at a time. And if even that is too much at once, do just 10-20 items on a rod at a time, working from left to right. Part of the issue, sometimes, is not wanting to make decisions about certain things, so if you have trouble, just force yourself to make a decision about each hanging item as you come to it, instead of jumping around in the closet to this item, and then that one. Sometimes being methodical can help! The goal for your closet, when this mission is completed, is to have only clothes hanging on your closet hanging rod that you love or wear frequently, and that they are not so tightly crammed into the space available anymore. When you overload the hanging rod in your closet it can actually cause the rod to collapse and pull out of the wall, which is a disaster to have to clean up. In addition, when you overstuff your closet, and have too many clothes on the rod, it makes replacing the clothes back onto the rods a bit pain, and difficult, which means you're much less likely to do this task. I've found for myself that this actually leads to clothes that should be hung in your closet instead left in your bedroom, or your laundry room, in piles, that themselves are clutter. 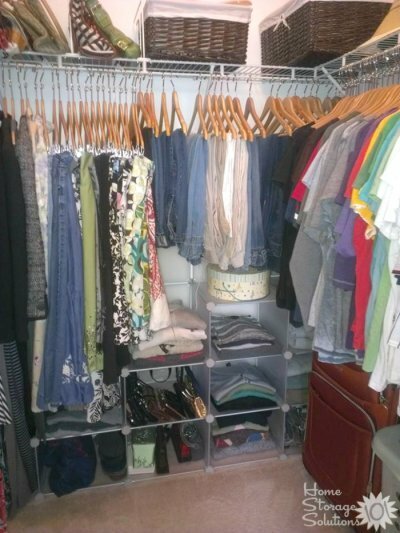 Surprisingly, decluttering your closet can help you declutter these other problem areas as well. A clutter free and organized closet is much easier to maintain, and also allows you to get yourself ready for the day much more quickly. You'll really love it when you've got it just the way you want it. 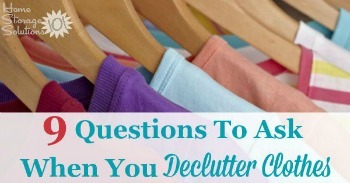 If you need some help deciding what clothes to declutter, remember to check out this article with 9 questions to ask when you declutter clothes. In addition, one simple trick of turning your hangers backward helps you identify wardrobe clutter within your hanging clothes, because it will allow you to know, over time, which clothes you wear and which you don't. Check out the linked article for more details if you'd like to do this task first, a few months before tackling this mission. 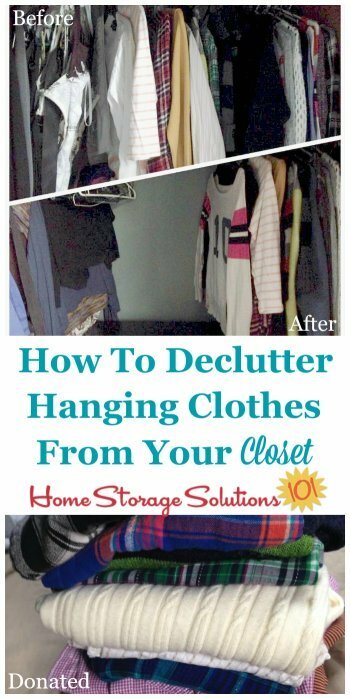 Finally, you may also find that after you get rid of a bunch of your hanging clothes that you get the urge to declutter hangers too. If you want to do that, check out the article at the link for more details about that mission. Now, make sure to scroll down below to see pictures from other readers who've realized they need to do this decluttering mission, or who have actually done it. It can get you inspired to tackle this task for yourself! First, here's a photo from a reader, Trish, who realized she had too much stuff hanging in her closet once the rod pulled free from the wall. I've seen entire closet systems, including rods, and shelves, ripped from the wall from too much weight, and it is such a pain to deal with, on top of needing to declutter and clear out the space. Try to avoid this outcome if you can, by decluttering some now! Here's a before and after sent in by a reader, Brandy. She showed not only the difference in her closet once she'd done the mission, but also the clothes she decided to donate to Goodwill. As you can see from the after photo, doing this mission can free up a lot of space for you! After all, both hangers and the clothing hung on them are pretty bulky! 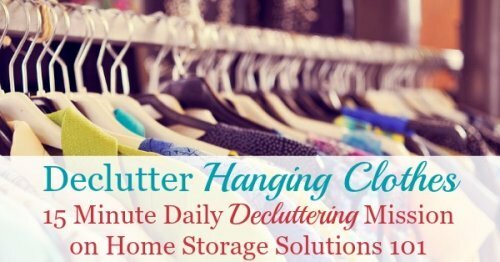 Are You Ready To Declutter Some Of The Hanging Clothes In Your Closet? I hope you're getting excited about the great results you can have when you do this challenge. Here's just a couple more photos from readers that I thought were outstanding, and really show what you can get accomplished! The first one, above, is from Dawn. She not only decluttered but then went on to do some organization, getting an organizer from Costco. She said, "I picked up the shelves at Costco for around $30. I love that I'm able to build them how I want to accommodate my closet's needs." It looks great Dawn! Wonderful job, don't you think? Further, this photo above is from another reader, Erin. 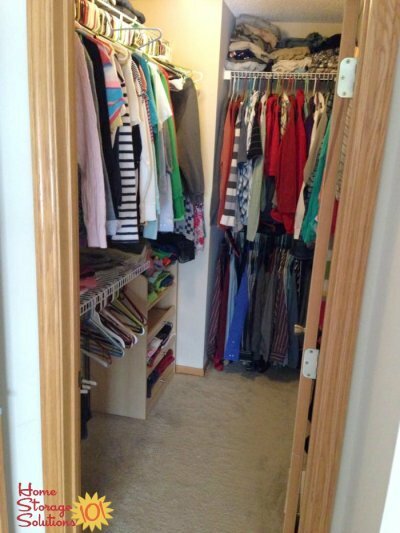 She said, "My husband and I just decluttered our walk in closet and dresser. 4 1/2 large garbage bags full of clothes are ready for donation! Wish I had taken a before picture!" Great job Erin! You and your husband made a great team, and it looks wonderful inside! I hope seeing these pictures has inspired you to declutter your closet. 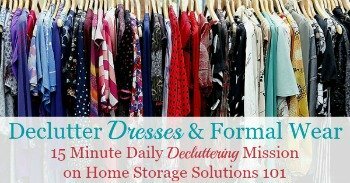 If you've got a lot of dresses and formal wear within the hanging clothes of your closet, also be sure to check out this article on how to declutter dresses and formal wear here. 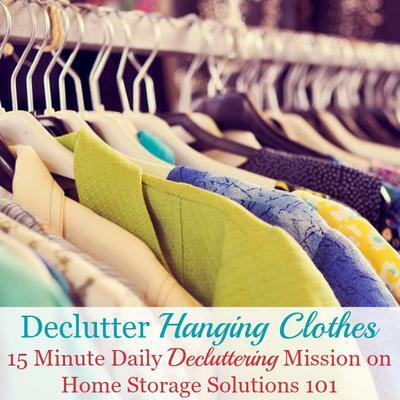 Comments for Are You Ready To Declutter Some Of The Hanging Clothes In Your Closet? Decluttering: Safety for young kids. An important reason to de clutter a crammed closet is safety. A friend's young child was playing "hide and seek " in her closet and the rod collapsed, burying him. Fortunately he did not suffocate! Oh my Caroljean, that is scary. I'm so glad your friend's son is OK, and yes, this is definitely another reason to declutter your hanging clothes some! 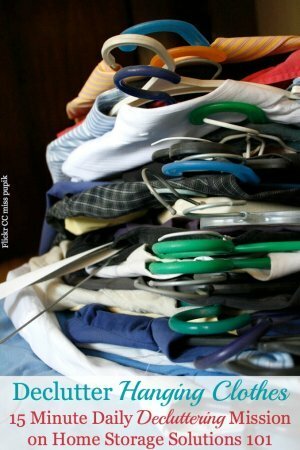 Additional ideas for decluttering clothes. which is very hard for many people. Group together all tops, sort by style, sleeve length, then color. Same for slacks, jeans etc. Then look at each type. All tank tops, etc., and use the 9 questions, does it fit? love it? have too many? etc. Pull out and donate what you don't need in each category. That way you can see you have 12 identical black t shirts and only need 2. Just my idea. I have completed all 365 decluttering missions and am addicted now! Lol. I’ve even gone through and done several missions again to be able to downsize even more! This has been very helpful in my trying to have more of a minimalist lifestyle and helping me prep to have a tiny house. It’s also helped me be able to downsize a whole bedroom, bathroom, and part of a kitchen and garage in order to help our family & have them come live with us for awhile during a hard time. I’ve been able to downsize my closet so much that I can fit my son’s closet into mine! I wish when I started I would’ve taken pics but just know that it’s been a transformation. :-) Your forms have also helped me gain structure, organizational, and flow into my life and I just wanted to say Thank You so much! I am saving money too by applying your tips for a decluttered life! My husband thanks you for that. Lol. My kids are even picking up on decluttering too! Thanks for what you do!